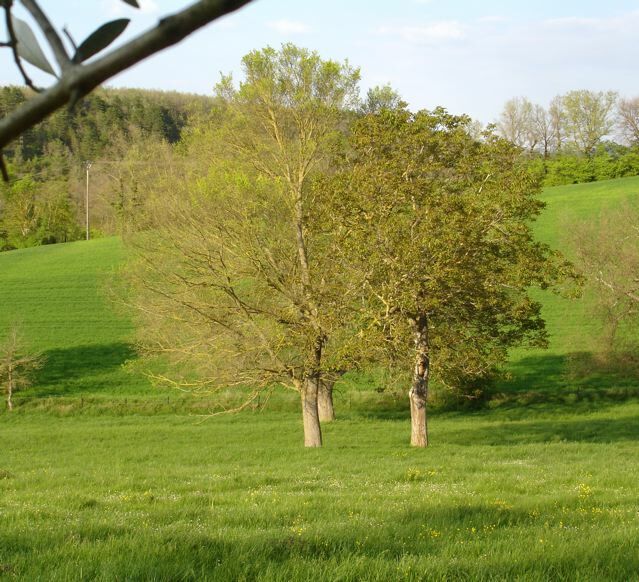 The oak and and the walnut–two tardy trees–seem to be competing to be the last to go green. The false acacia is as usual first out in the front garden. We have three of them and their unbashful arrival is a reassuring sign that winter is on its way out. Now the Judas tree is in full bloom and the young Liquid Amber is leafing out. Curtains up on “Easter Parade”–but these two rivals are still in the dressing room! They remind me of a scene in a film a few years back when two veteran actors are seated in front of a roaring fire on dueling armchairs. Each attracts attention by gradually lowering his voice, until both are whispering and we, the audience, almost feel the heat as we lean forward to catch what they are saying! In the cow pasture behind our house the oak is winning this particular duel. They always edge out the walnuts in the greening game. They keep their old and brown leaves well into the new year, last to admit that things must change. The people round here call the wood of the oak [le chene]—un bois noble. It’s a hard wood–which lasts. 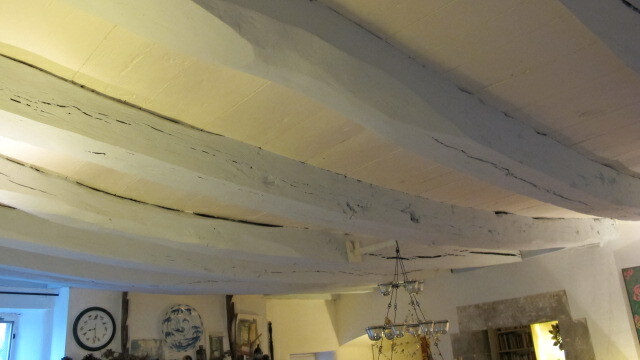 There’s a lot of it in this old house–beams bent with the weight of the tiles they support. They’ve held for almost three hundred years–a noble wood indeed! Perhaps it has earned the right to takes its time–and be the last to green.